I’m late but if you have frizzy hair in general your locs will be frizzy. Will the frizz die down as they mature? yes but be gone completely? Never. The only way to combat frizz is to retwist more often, interloc, or clean the strays and fuzzies with scisssors. None of which I want to do ....so frizz is here to stay for me. Especially since I go 4-5 months without retwisting now. Cattypus1, almond eyes, shortycocoa and 2 others like this. Too long? Try 48 hours I have about 4 months worth of roots. So pretty much every other day when I oil my scalp I go through and make sure none are sticking together. If I go longer than a week it’s a wrap. prettywhitty, msdeevee, CocoGlow and 1 other person like this. At my last retight I asked my new consultant about that intermarrying thing. I told her I’m afraid one day I’ll wake up bald because it seems like everyday I’m snap, crackle & popping locks apart. She said as my former consultant said it’s natural with locks & nothing to worry about. Our hair is just growing and they naturally grow together like that but when they retight or retwist they just include those hairs in . I haven’t noticed any thin spots yet so I trust them. Seems like I have to do mine on the daily. Cattypus1, CocoGlow, BillsBackerz67 and 1 other person like this. My hair the same length so this video is super useful. I'm not into interlocking my hair as it makes my locs stiff. I'd prefer to maintain it through the frizz and go longer between retwisting as I know it's not good for my hair. Cattypus1 and shortycocoa like this. My first interlocking session is in the books! Officially on this journey! shortycocoa, BillsBackerz67 and almond eyes like this. Let's talk about parting at the crown and hair line for a few minutes. It's the source of lots of anxiety but I'm not anxious just curious. 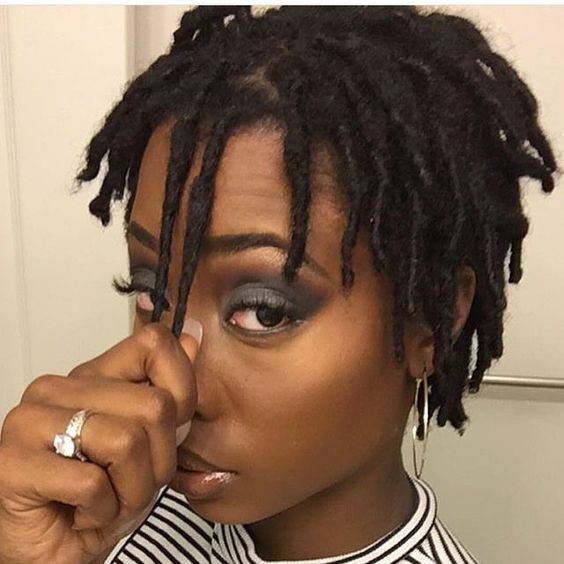 Locs are on my radar and I've been paying attention to parting choices. 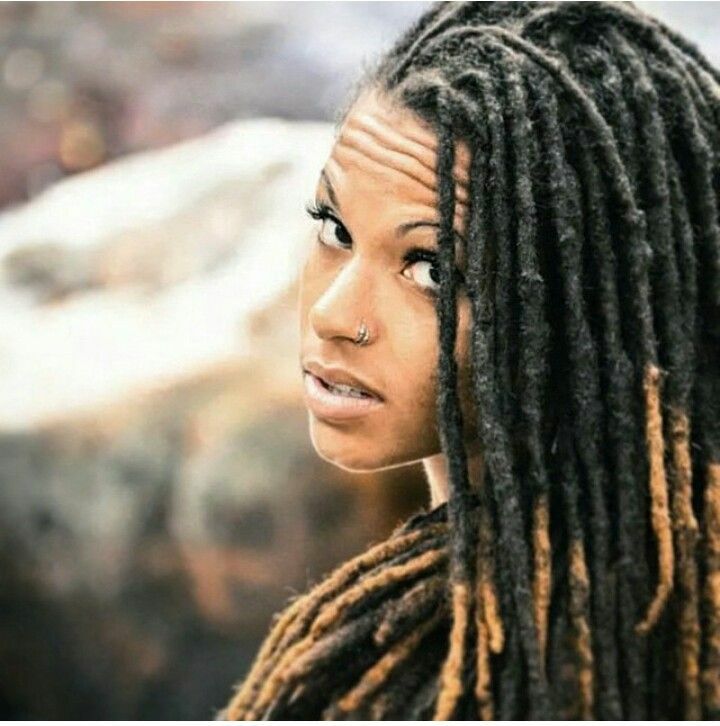 I noticed that how locs are parted in the crown and hair line impact how the locs fall and frame your face which is a big part of being happy with your locs. The first time I loc'd I use small diamond parts and my hair line looked something like this. I really hated it because the hair kept falling down into my face. Everyday, Nothing more frustrating then locs falling down the middle of your face. Then I see this parting, where the comb is dragged from ear to ear across the top of the head and slats are created at the hairline. I've never done this but I think this contributes to thinning at your scalp as the hair is always twisted back on itself. Can someone confirm or share their experience with thinning in this area or just generally? The benefits to my mind are that the hair falls away from the face and when pulled back there is evenness all around. But then it looks like a part is created naturally by the way the locs fall sometimes. Don't know if that's good or bad. This is the way I twist my loose hair and I like that it does not stress the follicles because it matches how the hair grows naturally. But I've not used the pattern in locs. If you have, do you experience problems or frustration when pulling your hair back and do you like the way the hair looks when pulled back when it's parted like this. Does it fall excessively in your face? Then there is the center part. Never thought of this one but some have. I'm sure there are up sides. If you have this hairline parting I'd like to hear from you too. What kinds of benefits or frustrations do you experience with your choice of crown parting and hairline? Which would you not try again? And are my takes on each one what you experience? If you've spoken to a loctian about this and what goes into deciding I'd love to hear from you. shortycocoa, Cattypus1, CocoGlow and 1 other person like this. This is interesting. Have you found it to be true? Has your experience with both validated it? shortycocoa and Friday like this. I have sisterlocs with fine strands and I call my hair fruzzy (frizzy and fuzzy hair), for me using a shower cap could lead to over moisturisation and more fruzziness. I listen to my locitician and she specializes in all types of locs. 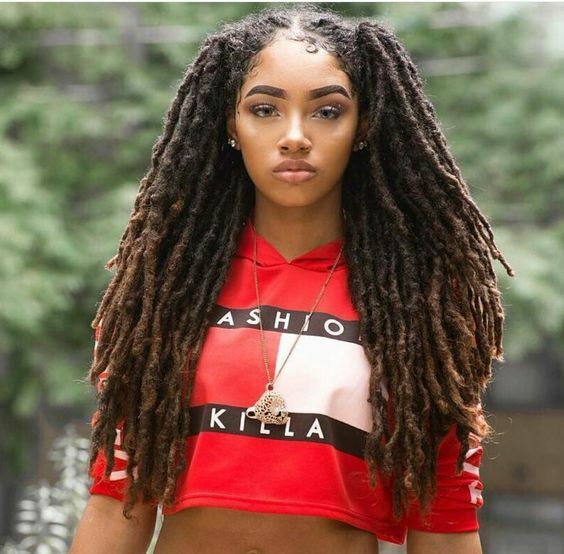 When I was a loose natural and wore extension braids and wore shower caps diligently, my hair would get too moist and my braids would get immediately messy. shortycocoa, Cattypus1 and Friday like this. @Friday my face is an oval too. I like the parting now but I’m so new. It falls just off of my face. I don’t cover at night because I don’t like the stuck to my head look but I do sleep on a satin pillowcase. I wear a shower cap too because damp hair in the am is not the business. I’m not winning any beauty contests but I’m just keeping it moving. SuchaLady, BillsBackerz67, CocoGlow and 4 others like this. Congrats @mz.rae! My 1 year locaversary is next month. I can’t believe it’s been a year. I love my sisterlocs and wish I started my journey when my mom first got hers established, 7 years ago. 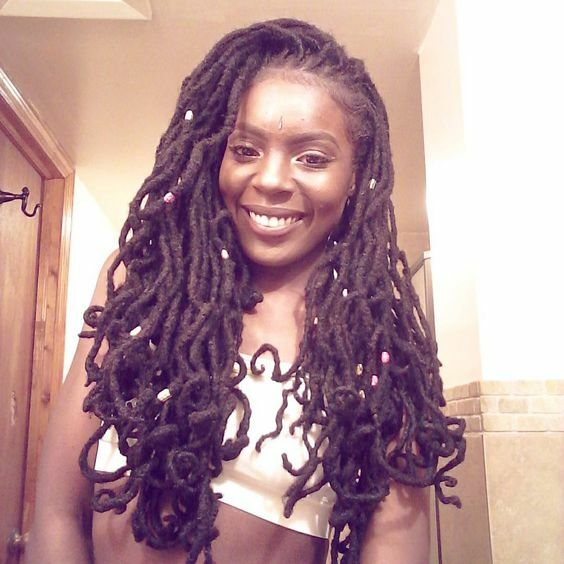 I have some locs that feel fully loc’d, some where only half the loc is loc’d and others that have only bud mid way down or at the very end of the shaft. Is this normal? This morning I feel like my hair was everywhere. I wore a headband to pull it back out of my face. Walked past a mirror and had to do a double take. I’ll be happy when they mature enough to where they grow down instead of out. BillsBackerz67, mz.rae, CocoGlow and 2 others like this. I'm 3 months away from my third anniversary. Still have locs that haven't locked but I'm not concerned. I had a bit of slippage and avoided using conditioners in the past. I'm now using conditioner and placing avocado oil down the length. I'm not sure how I missed this post but it's ok. Rules are made to be broken and you took what you needed from them and left the rest. Your hair is and will be okay. I surely washed and wet my starter locks often and I still do and my hair is fine. I never covered my Sisterlocks at night with scarves or bonnets, partly because my consultant at the time told me it wasn't necessary and I could just sleep on them without my hair being covered. The other part was because my husband at the time hated bonnets, even when I was a loose natural. He said it was unattractive, and I would have to agree. I do cover this set of locks at night though...even though I do have a smooth satiny pillow case that I sleep on from time to time. I just don't sleep directly on it without my hair being covered because it has a lot of lint stuck to it and I don't want that lint to end up in my locks. I need to get some more of those. @ the bolded......alright now!!!!! Yay! That's what I'm talking about! The locks at the bottom or in the back always seem to lock first or get to the point where they don't unravel when washed or wet the fastest. The rest of your hair will catch up soon and are probably already well on their way. I'm so glad you are in love with your locks! Congratulations! I'm sure you feel very proud of yourself! I can't relate any personal experience with this method because I used a different parting method entirely, but I will say that it does seem like the sets of locks I have seen that have been started this way do seem to be thinner along the hairline. I would imagine that they also maintain closer together to also get that look or want extremely neat locks. I think that if you prefer your hair to fall away from your face like in these pics, you can go with this method but maybe your maintenance schedule needs to be further apart to avoid the scenario you described with the thinning along the hairline, or make the locks larger along the hairline so they don't thin or break over time. When I had Sisterlocks my favorite way to wear my hair down was with a center part, but of course, I think we're talking apples and oranges here, since SLs are established with a specific grid pattern. But I do believe when my consultant was establishing my grid she would not talk to me and did not let me talk to her until she was finished because she said she needed to concentrate to make sure all her parts for all the sections were even. It was so long ago, but I do think she also started with a middle part and then sectioned off from there. I never wore my hair parted on the side that much because I preferred and liked the middle part the best, but maybe some of the other ladies will come and share their experiences. My face is naturally very round, and when I've gained weight it gets even rounder, if that helps. Conversely, when I have lost weight my face gets smaller and looks more oval and pointed, depending on the angle. 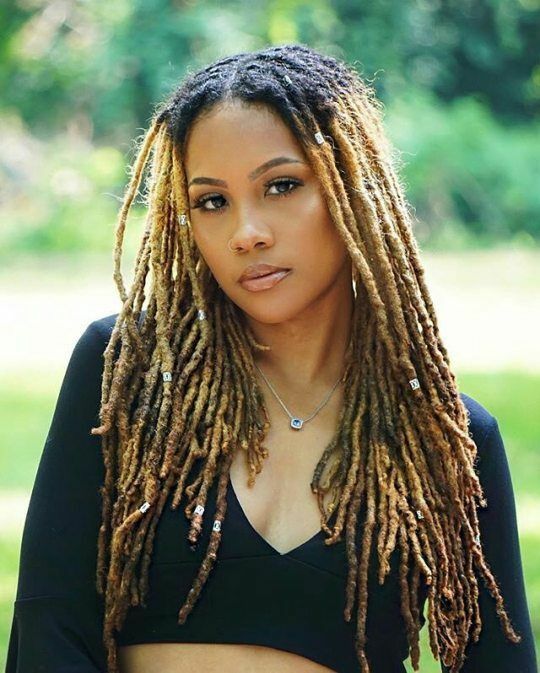 All of the women you posted and their locks are beautiful. Thanks for sharing. Your hair looked good with that parting. How come you didn't like it? Did you do diamond parting with each set? I'm also going to go out on a limb and say that there are so many factors that goes into how a loctician decides how to part a client's hair, with the number of locks a person wants being one of them. Also, from what I have seen, people who start their own locks seem to decide on what size locks they want first, then how many locks they want, then the parting pattern gets determined last. Each time I considered locks in the past I always thought about the size locks I wanted first. I'm not sure if you saw my posts earlier in the thread where I talked about the parting method I used, but I will link it again so you can see. To answer some of your questions in your last paragraph, I think with that meticulous grid parting that came with Sisterlocks I loved it, but my hairline never stayed and the locks along my hairline and on the sides would always unravel so I didn't like that. It also changed the way my hairline looked a couple times when my consultant had to reinstall them and I also didn't like that. But I loved how neat a fresh grid looked and with styling, it's just so pretty to me. With this set of locks, I liked the method I used (the curl parting method) but I think if I had to do it again I would take my time and re-part my hair so that I was starting with even sections or blocks of hair from the jump. But I also think it gives my locks more character and personality that I didn't start them with super even sections. I think maybe the back sections were pretty even but the other sections, especially near the front, were not even. I told ya'll I was through dealing with my hair and was ready to get this show on the road and just start my locks. It hasn't really affected how I style my hair that much, and I don't have a super even middle part. It bothered me for all of two seconds, and then I was over it. I actually like having an off-center part and there is even a zig-zag in the middle somewhere. I think that's dope. My hair doesn't fall in my face unless I actually plan it that way or "make" it fall in my face, if that makes sense. I just use hairpins or barrettes to keep my hair off my face some days if that's how I want to style it. So I’m having some shrinkage after I interlocked and then washed. It’s shoulder length now instead of pits stretched length. For daily care I am using Jojoba oil. I’m noticing that I have a couple of locs joined together near the scalp where I accidentally interlocked them together. What do I do? I was planning on letting them grow out a bit to see if I could separate later. I also have some shed hair. Is that normal? I don't think you can separate them at this point. They're joined together. I've never been successful at separating locks I accidentally interlocked together so I have always left it. You will probably have to cut off one of the dragons later on and reattach it to another lock later, or just throw it away if you don't want to reattach. It's normal for some hairs to shed during interlocking, but the hairs are probably coming from along the length of the lock that haven't fully meshed with the lock yet. I always save those and wrap them around the locks after I'm finished. If you just have shed hairs in general still save those and wrap them around your locks. Congratulations! That's so exciting. Whatever you decide on, I can't wait to see the finished product. Congrats to you, too @mz.rae! That year went by fast, huh? All of that is normal. Give it a few more months (I'd say about 3-6) and then all of that will be sorted out or close to being sorted out. Congratulations to you as well....man all these anniversaries coming up! We showing out!!!! How is the avocado oil working for you? Is it heavy or light? I've always wondered about that. It's my 9 month anniversary today! In 3 more months I'll be hitting my one year mark. I can't believe it. I'm still loving my hair. I haven't decided how I'm going to style it today. I might just keep rocking the same style I've been wearing all week, since Sunday, I think. I retightened DS 2's locks last Monday, if I recall correctly. He was NOT happy with me, ya'll. But we got through it. At first glance it always seems like his hair looks the same, but I can see the transformation happening. Especially when I looked at some pictures of where he started from and what his hair looks like now. He will hit 4 months this Saturday. DS 1's locks look sooooo good now!!! I have made several observations about his hair during this process. I have noticed that initially when I was spraying his hair with my Infusium mix and then using a wet washcloth to rub his hair, it was taking a longer time for his coils to form. I should have expected as much, since Infusium is basically not only a leave-in conditioner but a detangler. So I stopped using that once I realized that all my work was being undone every day that we worked on his coils. Then I switched to the rosewater spray, but I was spraying his roots and the ends of his hair and then using a wet washcloth to rub his hair. This method was giving me mixed results. It's like some of the coils in the back were forming super tight and then in other places of his head they were taking their time to form, and some of them were reverting. So I had to adjust what I was doing again. I still continued using the rosewater spray, but I stopped spraying the roots so much and focused more on spraying the ends of his hair and then instead of wetting the washcloth under the faucet, I would spray rosewater on the washcloth and then put the washcloth in his hair and rub in the direction I wanted his locks to form, keeping the same direction throughout. (clockwise) That method netted me the best results and has his hair looking amazing now. Even his Early Interventionist commented on it when he had his session with her last Thursday and said his hair is looking super defined now and way different than the last time she had seen him. It looks even better in natural light, (read: outside) so as soon as I can, I will get some pics of him in that type of setting and post. I try to work on it every day, and sometimes I miss a day and that's fine. I just resume the next day. I always do it before he goes to school each day to refresh his hair and reshape his hair because it gets flat on the sides that he sleeps on and I try to get the lint out from sleeping on his blankets. I need to go ahead and find him a skull cap or something to wear at night to prevent that. This week I also started working on it at night after his bath for a few minutes while we're waiting for the water to drain out of the tub. He will be at one month next Tuesday, already. I am really glad I did this and wish I made the connection to start his locks this way a lot sooner. It would have saved me a lot of frustration, I tell you that! I tell him everyday his hair looks so cool....especially when he gets fidgety and starts screaming or moving his head a lot when I'm rubbing it with the washcloth. I think he's very sensitive on the left side of his head because every time I get to that section he moves his head a lot more and starts avoiding/eloping. Me telling him his hair looks cool and asking him if he wants to see it usually redirects him well. So I will take a quick break and show him what his hair looks like. But sometimes he says no, he doesn't want to see it and then we just proceed. It legit looks like I took my time and parted his hair in these super neat parts and made super tiny coils, but nope....it's all in the washcloth and the hands. I also made sure to apply more pressure while I was rubbing once I started to feel little sections of hair start to clump together to form a coil and focused on doing that, instead of just loosely rubbing his hair with the washcloth. I'm still not sure how I am going to maintain his locks as his hair grows out. I would take a couple of the coils and twist them between my fingers just to help the process along and also to see how he tolerated that, and he moved his head and tried to cover my hand every time. Interlocking might be way out of the question, unless I find a way to do it when he is sleeping. I also thought about trying to interlock some of them together to combine them, but I may just leave it to see how they will form. I just didn't want to be having to retighten or retwist 200+ locks on his little head. I haven't counted them yet, but it looks like he has close to that many. I do really want to interlock the base of all of them for extra security, once I am content with the way they have formed. But I won't do that yet. Some of them are too short for me to do that, even with my smallest yarn needle, so I'm going to wait. Hopefully he will let me do that but I know how he is set up so.....it might be a no. I also haven't really washed his hair yet, but his hair is ok.
Is it heavy or light? I've always wondered about that. Avocado oil is very light--a fraction of Castor. BillsBackerz67, prettywhitty and shortycocoa like this. when my consultant was establishing my grid she would not talk to me and did not let me talk to her until she was finished because she said she needed to concentrate to make sure all her parts for all the sections were even. I did diamonds with each set. It was a lot of work but my hair is fine and thin with medium density and I wanted good coverage. You are right. I decided on the size first, that dictated how many and then I was left looking at the hairline like . Your comments are quite a revelation. Thanks. Maybe I'll start with the hairline then part around it? I read a bit about the curling parting method but I wasn't sure I understood. If you have link I would appreciate it. It sounded like a type of freeform parting. It sounded good to me because I love the look of freeform but don't know if my could relax enough to accept the process. I have small 4a coils with a little 3c and 4b I wonder if my hair would part naturally in sections large enough for what I want. I think you will be pleased with the parting method if for no other reason than your hair is sectioned by DNA. Seriously, the growth pattern of your hair and what it accommodates naturally should allow it to flourish. #1-yes, it surely was! And she was dead serious too. I held my breath the entire time too....I didn't even want my breathing to mess her up. But that grid was tight to death when she was finished with my install, though! #2 You should definitely start in the front and do your hairline first. This way, it will give you a chance to establish how you want your hairline to look and how you want your locks to fall and frame your face first, before you invest a lot of time doing your whole head and then the hairline last. If you don't like it, you can redo it until it looks right to you and you would only be redoing the front and not continuously redoing your whole head if you find you don't like the way it looks. There's one other post I'm trying to find where I showed actual pictures of me sectioning the last section of my hair but I can't seem to find it now. I will keep looking. But you can look at these for now. ETA: I forgot to address #4-based on what you said about your hair type, I think the curl parting method would be great for you to start with. The curlier your hair type, the easier it will be for it to clump together and define so you can determine your lock size. It sounds like you want larger locks, no? Where is the 4a, 3c, and 4b distributed in your hair? Is the 4a mostly distributed along your hairline or is it mixed in to other parts of your hair? You might have the hardest time establishing the locks with the hair that is 4b, because it won't clump and curl together the same. I have two parts of my hair that seem to do that also, but it's mixed in with 4a so that helped me some. It's on the left and right near my ears. To remedy that I just used more gel in those parts so I could see where I needed to separate the curls to make the locks in that section. CocoGlow and Friday like this. Thank you! Time really does goes fast and you will get there before you know it! 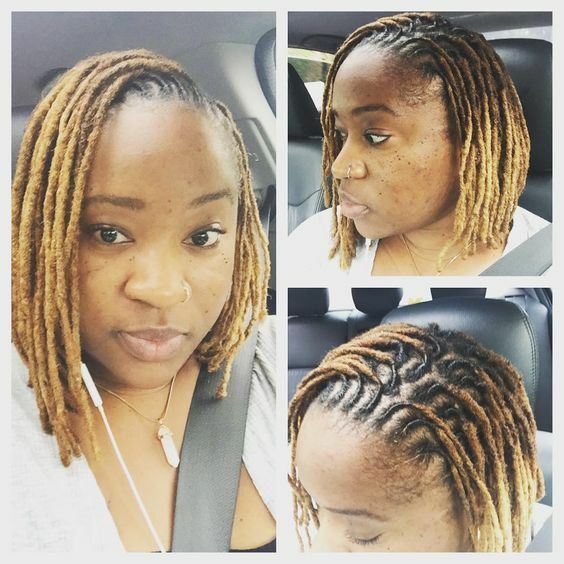 It’s like looking up and being shocked at how far your locs have come! @Friday I found the post. It was in my face the whole time...SMH. Also, if you scroll down to post #1914 you can see my hair after a fresh retightening to see how it falls, if that helps. I understand now. It's an interesting approach. Certainly doable. I think I may give it a test run as I move closer to deciding. Thanks. You've been a great help and such a positive contribution to the thread. Cool! I'm glad I could help. Good luck with whatever you decide....I hope to see you back in here with a new set of locks that you are happy with! almond eyes, CocoGlow, shortycocoa and 1 other person like this. FlawedBeauty, shortycocoa and CocoGlow like this.